YOU CAN BE THE BEST THAT YOU CAN EVER BE! you're in good hands with the surf sports fitness experts! Nothing makes me happier than doing what I love and when I'm doing that for a living, it doesn't feel like a boring job and I feel so driven! Sports has always been my passion and I know I have to be in a career totally related to it. I have many other interests but nothing like action, adrenaline and endorphins! I've been running this business for 12 fruitful years and I'm still stoked! 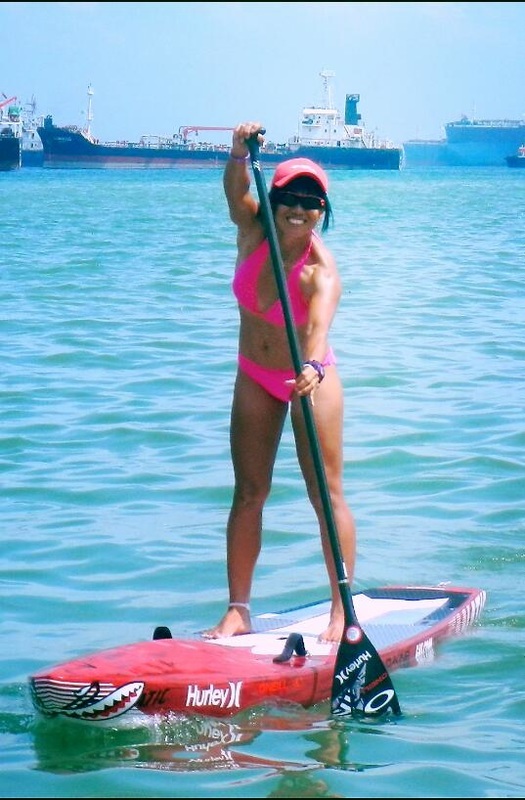 My business involves managing an online (used to be Retail Pro Shop at PA Water-Venture) store www.windkitesurfsup.com, running Windsurfing and Stand Up Paddling Lessons, trainings, rentals, events/races at Mana Mana Beach Club and my latest newfound passion, teaching outdoor Fitness Bootcamps in parks and Personal Training. Retail brands include North, Naish, Loft, Fanatic, Exocet, Chinook, Streamlined and many other products which we sell in the shop across windsurfing, kitesurfing and SUP equipment. The service side includes all the lessons and rentals to enable people to learn and improve until they are at the level where they can own their own equipment. The Fitness Bootcamps side is a nice complement to a holistic fitness regime that suits anyone whether one is a windsurfer, kitesurfer or SUP'er or just anyone who wants to get fit, go stronger, feel better and stay active for the next 40 years! High Intensity Interval Trainings benefit almost everyone and in every sport as it trains cardio, anaerobic, tones, strengthens and stretches one's body in a very safe way. I'm blessed to have Samuel Josh (8 years old) and Victoria Natasha (4 years old) with me at the shop everyday. With my helper's assistance, I am able to do it all! As a business-person, athlete, mother and coach. It's a lot more crazy than people think as I'm running here and there, tons of emails and admin to do on top of teaching classes, helping Samuel with his work and my own training as well. I won't have it any other way, I feel a deep sense of fulfilment that I'm always there for my kids, I helped them take the 1st step and heard the first 'mama'...nothing is more fulfilling than to pursue a career I love together with my kids. Without my husband's support and enablement, I wouldn't have it this way. How It All Started 21 years ago? I saw an ad for a windsurfing course in the TEENS magazine when I was 16 years old, took up the course and my life was never the same again. Windsurfing is really a difficult sport to learn and I went through hundreds of hours of falling, pulling, acquired bruises, drifted away and got into danger countless of times. Determined to 'plane' like the pros, I would hitch rides from the then-Macdonalds after a 1.5hrs bus ride from the west. There was no bus 36 in those days (it only materialised after lots of lobbying). I've always been active and loved trainings and competitions. I competed in National Schools' Track & Field all the way from Secondary to NUS, as well as in every sport there was such as Badminton, Basketball, Netball, Volleyball, Swimming, Table Tennis. I also did Triathlon and Biathlon while in NUS as well as Cycling (Road & Mountain-Bike). 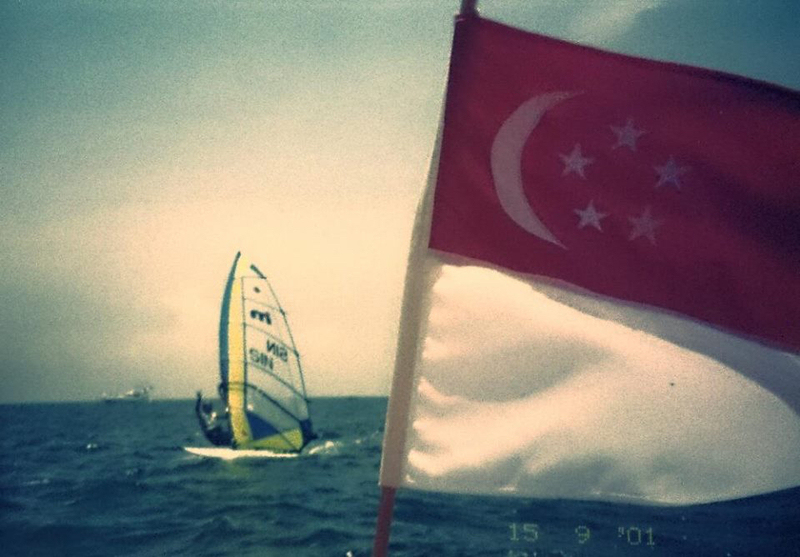 I was drafted into the National Windsurfing Team while I was studying in the NUS. Windsurfing is a relatively unsupported sport then compared to mainstream sports such as football and swimming. Even though Windsurfing was one of the disciplines within Sailing, the struggles were very real then being the earlier batches of windsurfers. Since high performance Windsurfing (or any sport) is done ideally in one's peak when they are young, I really wanted to pursue my dream of going full-time windsurfing and going as far as I can in representing Singapore. After I graduated from NUS, I found a job at ESPN but quit after a year to go full-time windsurfing. Things were really tough with finances as we didn't have much support. I worked part-time as a tuition teacher, gym instructor, freelance writer in addition to my studies and tough trainings to try to pay for the Mistral One Design equipment as well as overseas training stints and races. I loved the daily torture of full-time training from morning to evening, there's so much to learn, to improve and fight for. I was selected for the 2001 SEA Games and won a Silver medal. I enjoyed Slalom and Formula windsurfing, I loved competing in slalom and formula races and won quite a number of titles in the Asian Windsurfing Tour and other Asian races. I was the ladies champion in the 2000s era, haha. I raced my first PWA Windsurfing race in 2007 and discovered I was actually 2 months pregnant then. My unborn son had already done his 1st race with me. Since then, I took windsurfing on a more leisure route and focused on building my business in a way that enables me to bring up my children the way I desire and at the beach. I hope to inspire others to live healthy, live strong and live life to the fullest through sports and passion. Being a Christian, I've always believed that nothing is by coincidence. Where we are in life now is a culmination of decisions, steps and bits of all we've done in the past. Success or failure is a conscious decision and it's within the power of our grasp to make things happen. It IS possible to get fit. It IS possible to win a race. It IS possible to be a good and sporty mom. If I am to live to 80 years old, I would have another 41 years to go. With certainty, I would want to continue windsurfing, kitesurfing and SUP for at least another 30 years. It scares me to think that some friends have already gone to meet their Maker at 50 years old. Health is more than wealth. Health is so important that I would rank it right after our spiritual fitness. Either we spend $ now to stay healthy & strong now or spend that $ to get back the lost health via medical bills later in life. It is also very important to note that it's not enough to exercise once a week or just chase after the kids, or count housework as exercise. I hope to use my own life story as an inspiration to others, whether they are athletes, working adults, mothers or students...I've overcome many tough obstacles in my sports career and businesses and come out much stronger, wiser. There's nothing that we cannot achieve with determination, His wisdom, and resilience. Kids are not an excuse not to do it, they are MY reason! Only when we're healthy then can we take good care of our loved ones!